Oliver is currently the Senior Fisheries Biologist with the Yukon Territorial Government in Whitehorse. The Mackenzie River Delta represents the northern limit of grizzly bear (Ursus arctos) distribution in Canada. The Delta has low primary productivity and a short growing season, with bears active and feeding for as little as five months of the year. These constraints on the grizzlies’ ability to obtain their annual nutritional requirements, combined with low population densities and fecundity, make the Delta grizzly population sensitive to disturbance. Significant environmental changes, over both the short and long term, are projected for the Mackenzie Delta. In the immediate future, the proposed construction of a major natural gas pipeline through the Delta, along with greatly increased petroleum exploration, extraction and associated anthropogenic activity, will likely affect grizzly behaviour and habitat use. Over the longer term, the marked warming trend in the western Arctic climate will affect the distribution and abundance of critical grizzly resources. I will observe current foraging and denning patterns of Mackenzie Delta grizzlies, and project how these may change under various future scenarios. 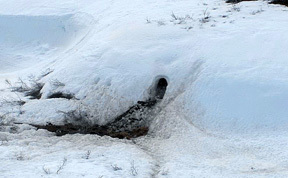 It has been hypothesized that grizzlies in the Mackenzie Delta preferentially den in south-facing slopes near water and away from human activity. I collated den site locations gathered by regional government and industry surveys, as well as den sites determined from GPS-collared study bears. From this database, I investigated den site selection criteria by creating a resource selection function model that compares the proportion of available vs. used habitat values for grizzly den sites. The model combines den locations within the Delta with data from high-res Lidar Digital Elevation Models, Normalized Difference Vegetation Indices and LANDSAT imagery into a GIS preference-surface model. This model is a baseline for impact assessments on the effects of anthropogenic environmental disturbance (i.e. petroleum drill pads, construction camps, pipeline corridors) on grizzly den site selection. The treeline is predicted to advance steadily northward in the Mackenzie Delta as the climate warms. Arctic ground squirrels, thought to be a key bear forage resource, thrive in the treeless tundra but fare poorly in the boreal forest. By comparing expected vs. actual ground squirrel colony presence along north-south transects encompassing the present-day treeline, I can create spatio-temporal predictions of the effects of treeline advancement scenarios on ground squirrel presence and overall abundance. 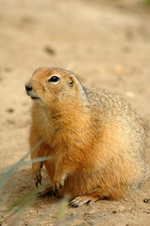 Predictions about changes in ground squirrel abundance and distribution, combined with a clearer understanding of their role in the diet of Delta grizzlies, will contribute to estimates of the continued viability of the Mackenzie Delta grizzly population.